After beating out Facebook and Apple for the purchase of Israeli mapping startup Waze, Google is now integrating the crowd-sourced Waze traffic updates into its mobile mapping apps. Google Maps will continue to buy traffic data from third-party vendors, but now that data will be bolstered by real-time updates about accidents and obstacles provided by 50 million Wazers (Waze users). Feldman, Barbara. 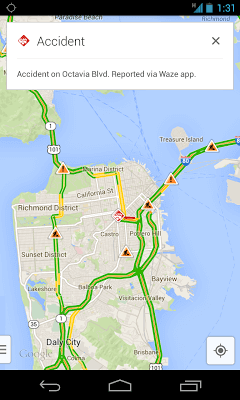 "Crowdsourced Traffic Data Coming to Google Maps." Surfnetkids. Feldman Publishing. 20 Aug. 2013. Web. 21 Apr. 2019. <https://www.surfnetkids.com/tech/2289/crowdsourced-traffic-data-coming-to-google-maps/ >. By Barbara J. Feldman. Originally published August 20, 2013. Last modified August 20, 2013.